The past year has been like a script from a Hollywood movie for a Sligo teenager who overcame a serious back injury to celebrating a sporting triumph. Keelan Kilrehill, a 15-year-old Colaiste Iascaigh (Easkey) student, recounted the accident last August which resulted in him breaking bones, including a vertebra. “I was going down to my cousin’s house on my bike when I met a car on the road, I hit the brake to avoid hitting the car but I went over the handlebars and hit a tree and was unconscious. 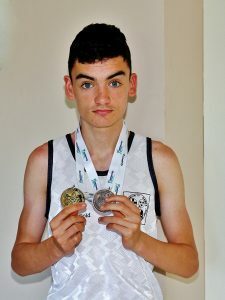 The Dromore West native runs with the Moy Valley Athletics Club and plays GAA with St. Farnan’s, but Keelan had to put all of his regular sporting activities on the back burner for a number of months as he went through the recovery process. For more on this story, be sure to pick up a copy of this week’s Sligo Weekender newspaper. In shops now!